To create a sustainable attraction for culture, education, entertainment, and economic development that will enhance the quality of life while preserving the historical importance of the most prominent, architecturally significant, and well known building in downtown Chatfield. Chatfield Center for the Arts, Inc. believes that participation in and appreciation of the arts enhances the quality of life for our community. Educational opportunities and experiences in the arts develop critical thinking skills, spur entrepreneurship, and prepare youth for 21st century careers that value ingenuity and innovation. Our programs draw forward-thinking, sustainability-minded families and individuals to the Chosen Valley to increase the vitality of the region and spur economic development. 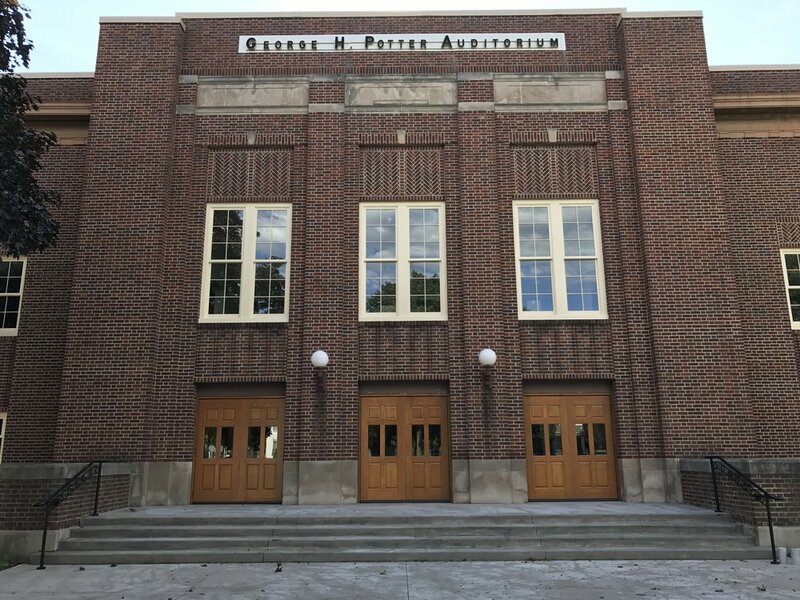 Since it opened in 1936, the Potter Auditorium has been an irreplaceable community asset as well as a potent symbol of the town's commitment to public education and the cultural enrichment of citizens of all ages. Designed by one of the state's most important architecture and engineering firms, the building is a notable, well preserved example of PWA modern style architecture. The 1916 high school building is also historically and architecturally distinguished and it reflects the history of public education in Chatfield. Contextually, it shows the influence of the early twentieth-century educational reform movement in school building design and construction. Potter Auditorium has been an integral part of the heritage of the Chosen Valley for more than 75 years. Potter Auditorium was built in the 1930's during the Great Depression and is now a historic landmark of national significance. The Chatfield Community is committed to the preservation and continuance of this still functional building. Conversion and expansion of the current structure into a 21st Century regional arts center, while preserving its historical character, now enhances the enjoyment of the community for residents and visitors alike. Potter Auditorium has been modernized and retrofitted into a regional, multi-use facility designed to enhance the enjoyment of theatrical and musical presentations in addition to speakers or conferences using the facility. The Chatfield Center for the Arts is located along US Highway 52 in the heart of Chatfield, MN just 15 miles southeast of Rochester, MN. Our footprint fills an entire block with parking available in our open lot off of Twiford Street and curbside parking to the north, east, and south of our property. The plan for the transformation of these historic buildings into a modern regional arts center includes significant upgrades and improvements to the buildings while being true to their original architectural and historical framework. We are very fortunate that these buildings were built to last and were well maintained, leaving the buildings with little work needed on the foundations, walls, or roofs. The layout of the buildings is also very conducive to the proposed use. 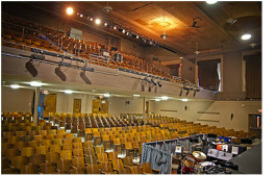 In fact, the 1916 building original floor plan included a small performance space that can be used to complement the much larger Potter Auditorium. What is needed is modernization (electric and plumbing), additional services (particularly restrooms), and updates to the paint, trim, and windows. Some flooring needs to be replaced as the asbestos abatement required removal of some of the original floors. To complete this task the project has been split into phases. We have also prioritized the refurbishment of rooms. As money becomes available, we will also update and modernize rooms to bring them into use.